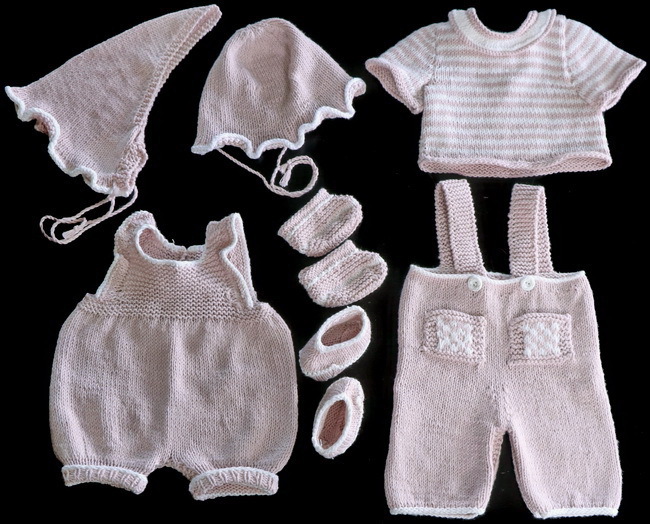 These summer clothes I have knitted for your doll. I knitted the clothes in Mandarin Petit Cotton yarn from Sandnesgarn. 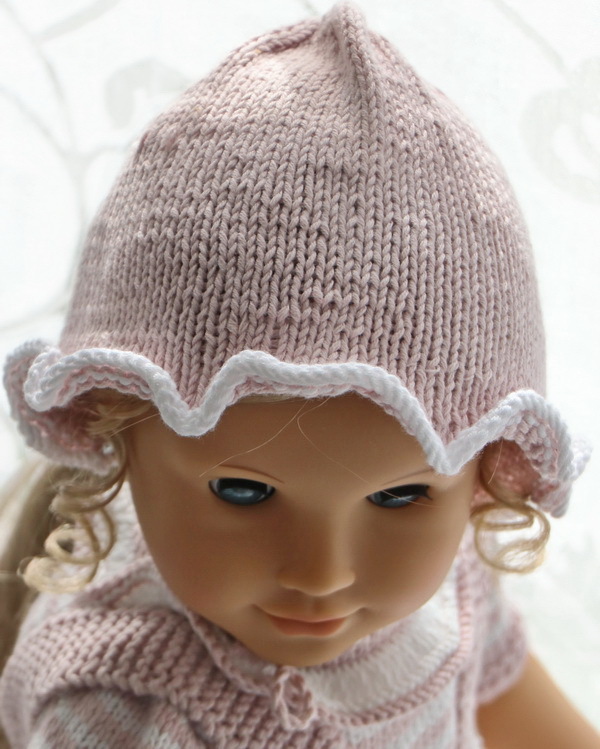 This yarn is perfect for knitting doll’s summer clothes. The thickness is approx. the same as for Thin Merino Wool and Lanett. 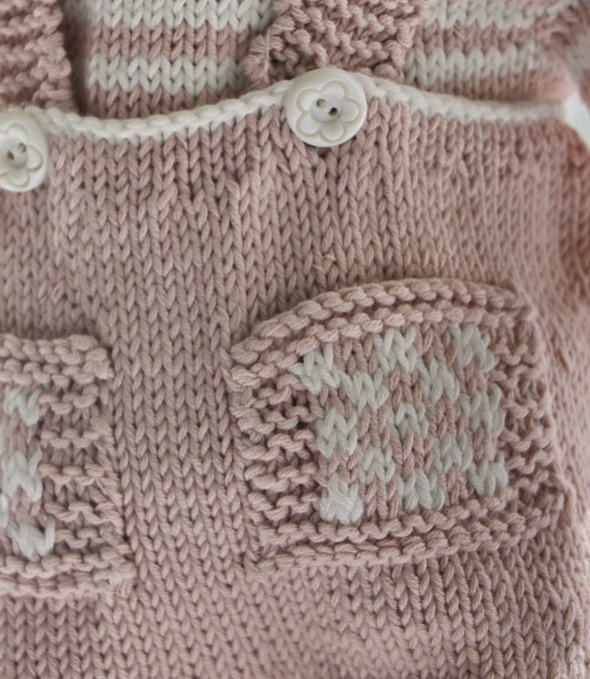 Therefore, you can use wool yarn as well for these clothes. 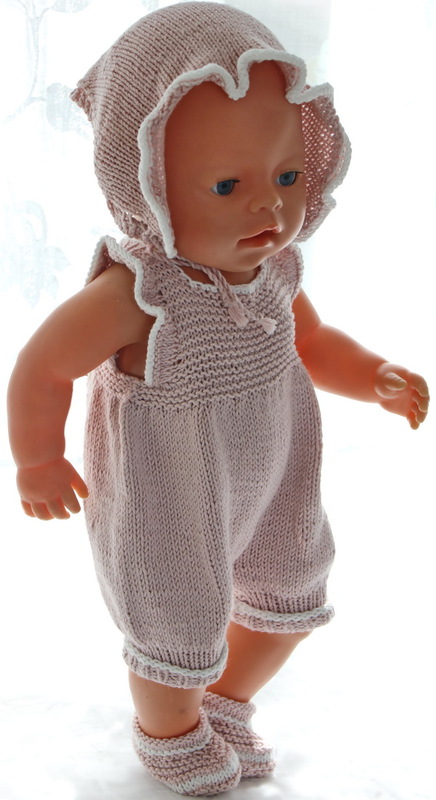 A wide and lovely sun suit will fit your doll superb on a warm summer day. The yoke is knitted in garter sts and along the arms, it has nice ruffles. Cast on 36 sts in white and knit 1 row. Change to pink and knit 1 row. Continue knitting a rib, k1, p1 alternatively 5 rows. Change to white. Knit 2 rows garter sts = folded edge. Change to pink and knit 1 row. Continue knitting 8 rows st st inside 2 edge sts at each side knitted in ga. On next row do the following increases: K2 edge sts, k4, increase 1 sts in every sts until 6 sts are left on row, k4, k2 edge sts. = 60 sts on row. Continue knitting 3 rows st st and edge sts. Put work aside and knit the other leg in the same way. Continue knitting both legs on to a circular ndl or 4 double pointed ndls. Place a marker for center back and center front. Always begin row from center back. Continue knitting st st until work measures 9 cm before knitting the pants back longer like this: K20, turn, purl 40, turn, k30, turn, purl 20. Continue knitting st st over all sts until work measures 15.5 cm (measured front) On next row decrease 1 sts in every 3rd sts = 80 sts on row in total. Continue knitting front and back separately. Small shoes knitted in garter sts. The suit is wide and lovely to wear. The color is in pink with white edges. Then I knitted a cute bonnet as belongings to this suit. 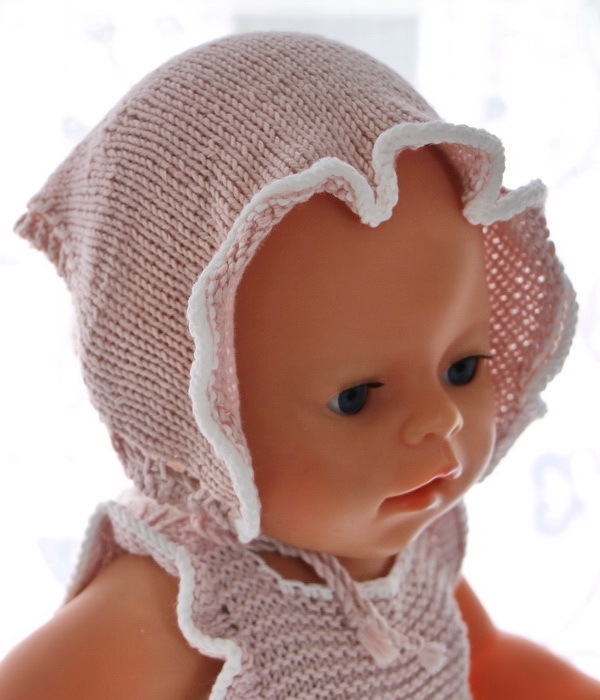 The bonnet is needed to protect the head when the sun is too hot during the middle of the day .The edge is wrinkled a little round the face and have a chord put through the eyelets. I have knitted 2 pair of shoes. Then you can choose. The 1 pair has a white edge around the leg and is knitted in st st. The other shoes are knitted in garter sts. Both shoes can be used to all these clothes. ... with pockets on the front. It is kept up with suspenders buttoned front. ... I am sure this outfit will look very tough dressed on your doll. Do you have a boy doll you can knit the clothes in blue or any color you might like? Cast on 80 sts in pink and continue knitting 3 rows ga. Continue knitting in the round on a circular ndl or 4 double pointed ndls 2 rows st st. On next row increase 8 sts evenly on row = 88 sts on row. 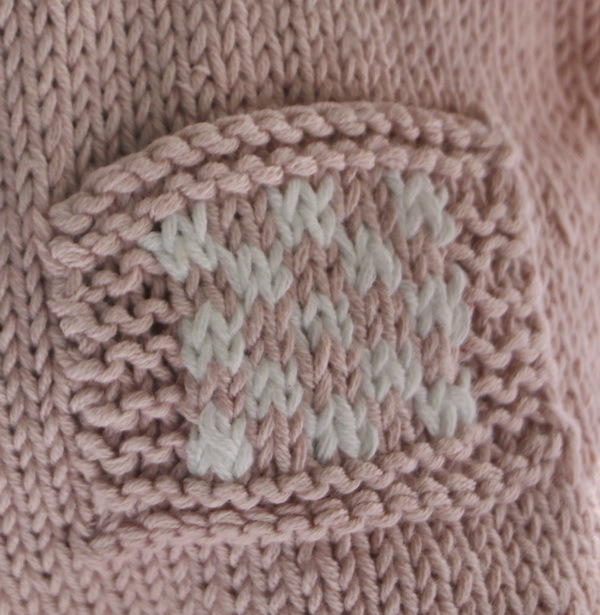 Change to white and knit 2 rows in white, 2 rows in pink alternatively until work measures 8 cm. On the next row cast off for the armholes like this; Cast off 3 sts, k38, cast off 6 sts, k38, cast off 3 sts. Knit front and back separately. Front: Continue knitting in stripes and purl back. At the same time decrease 1 sts at each side before knitting in stripes until work measures 14 cm. Cast off the 12 center sts and knit each side separately. Cast off 1,1 sts against the neckline every second row. Knit 3 rows st st and put shoulder sts on a cable ndl. Cast on 40 sts in white and knit 1 row. Change to pink and knit 2 rows st st inside 2 sts at each side knitted in ga. On next row increase 1 sts in every second sts inside edge sts = 58 sts. Continue knitting st st and edge sts until work measures 8.5 cm. Put work aside and knit the other leg in the same way. I then knitted a headscarf similar to the bonnet. Both the bonnet and the headscarf is nice belongings to these clothes.